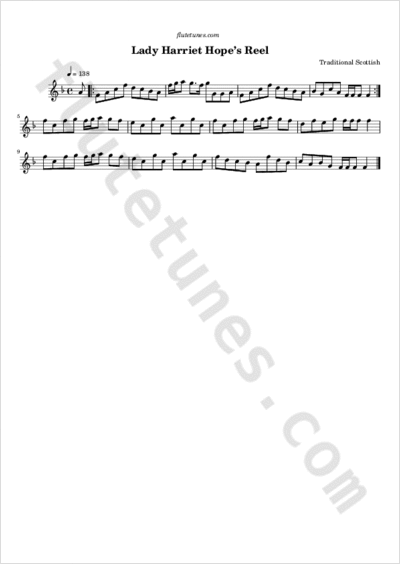 The earliest appearance of this tune in print is in Robert Bremner's A Collection of Scots Reels or Country Dances, published in London in 1757, under the title “Lady Hariot Hope's Reel”. The very popular melody subsequently appeared in many Scottish collections under titles such as “Lady Harriet Hope”, “Miss Hope”, and similar variants. Some sources have identified Lady Harriet as Lady Henrietta Johnstone (1682–1750), married to Charles Hope, 1st Earl of Hopetoun. This Lady Henrietta, however, also had a daughter who was a “Lady Henrietta Hope” (1706–1745), and a granddaughter with the same name (c.1750–1786). The earliest known publications of the tune could tally with any one of them!